Martyn Bennett (ed.) 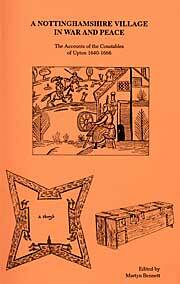 A Nottinghamshire village at war and peace: the accounts of the constables of Upton 1640-1666, Thoroton Society Record Series 39, (Nottingham 1995). Bunny and Bradmore, 1640-1690: Change and Continuity in an Age of Revolutions, MA dissertation, Nottingham University, 1991. 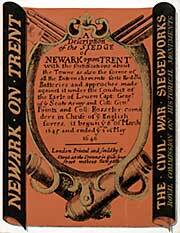 Royal Commission on Historical Monuments, Newark upon Trent: The Civil War Siegeworks, HMSO, London, 1972. Seddon, P.R., ‘Marriage and Inheritance in the Clifton Family During the Seventeenth Century’, Transactions of the Thoroton Society of Nottinghamshire, 84 (1980), pp. 33-43. Seddon, P ‘Sir Gervase Clifton and the Government of Nottinghamshire, 1609-1640’, Transactions of the Thoroton Society of Nottinghamshire, 97 (1993), pp. 88-98. Thoroton, Robert, The Antiquities of Nottinghamshire, ed. by John Throsby, 3 Volumes (Nottingham: E.P. Publishing, 1972).